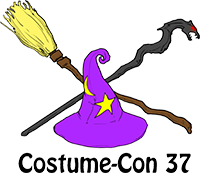 The Costume-Con 37 On-site DVDs are produced from the single camera recording the entire show from the back of the ballroom. This is mostly wide shots showing all performers on stage and is unedited. This is not the edited production from the multiple cameras which will be available later this summer. The prices here match the prices on-site, except that shipping is now mandatory and not optional.